Size/Weight: 18.4 lbs on Nov. 14, and growing! He’s just slightly larger than his siblings, but weighs 150% more due to muscle mass. 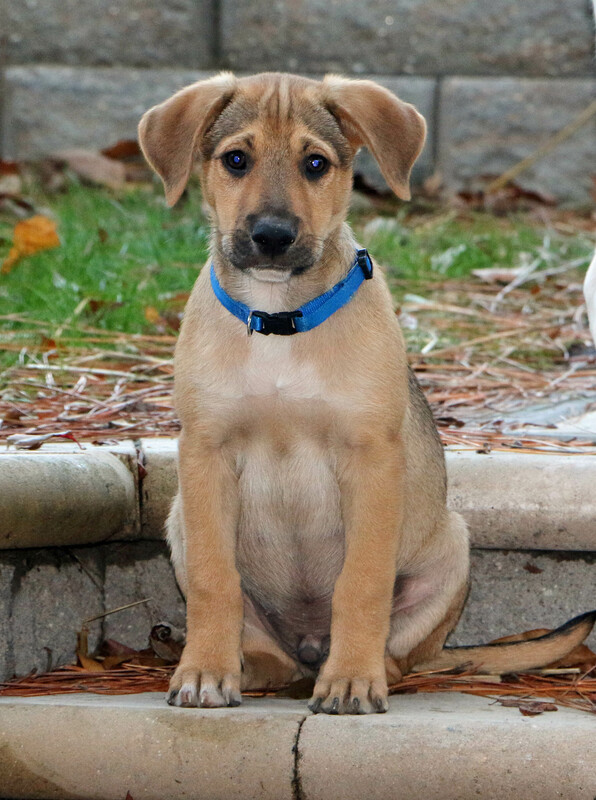 He has the biggest paws of the puppies, and we think he will be well over 50 lbs when full grown. Color: black overcoat, brown/caramel undercoat, with shorter hair. Breed: springer spaniel mix. Dad is unknown. 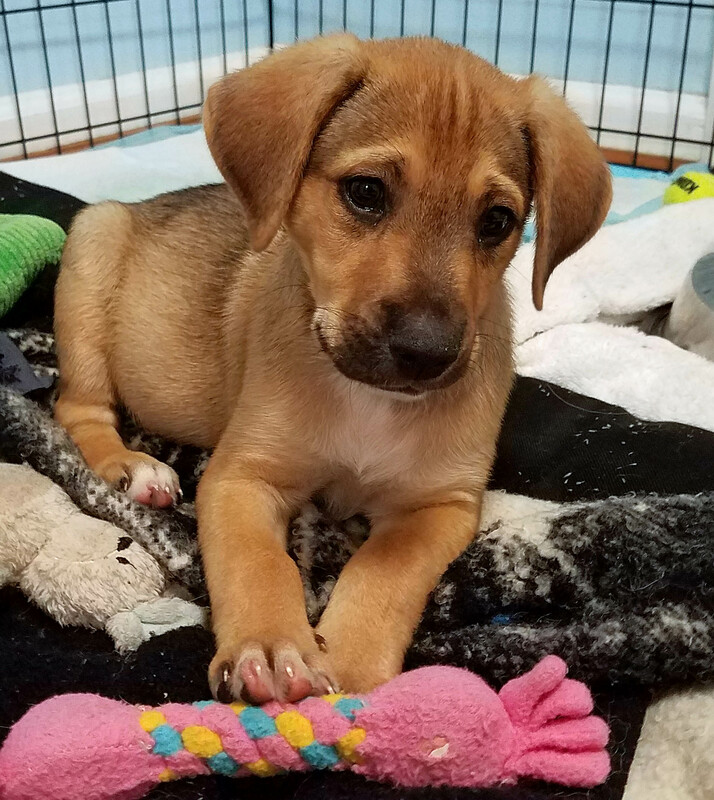 Mom is Honey, also being fostered with Above and Beyond Rescue. 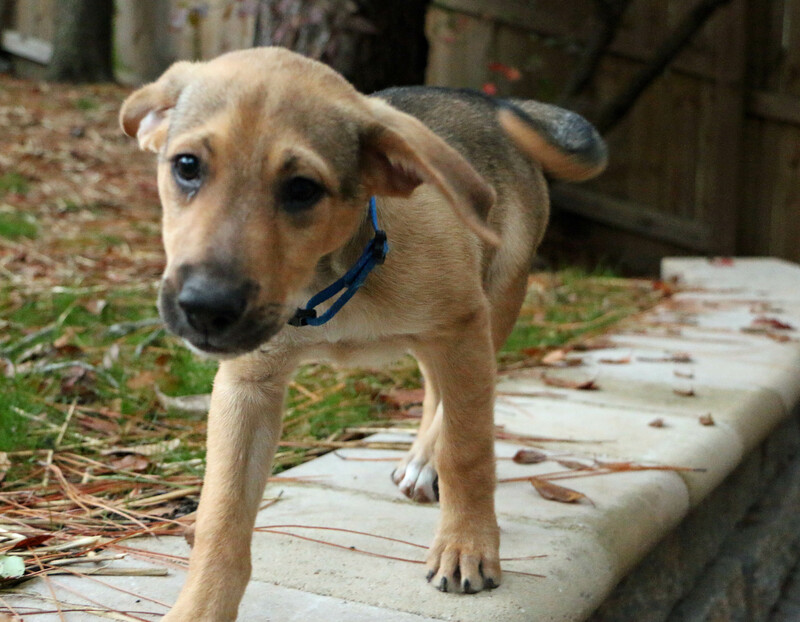 Good with Dogs: He likes to play with the adult dogs in his foster home. Sometimes he does not take “no” for an answer, and will jump on their backs. He is always playful, though, and has not shown any signs of aggression. Only playfulness. House trained: He will bark, whine and paw at the back door when he needs to go #2. For going #1, he prefers going outside, but still has accidents inside if you are not watching him closely. Crate trained: Will not go #2 in crate, but still has #1 accidents on his blankets. Leash trained: He hasn’t had much practice since he’s not fully vaccinated. Behavior: Starbuck loves to sit in your lap. 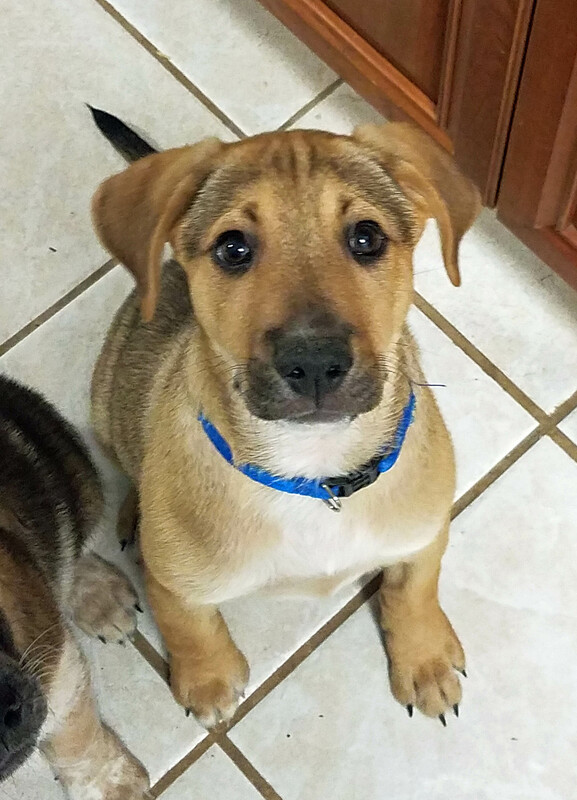 He will give you kisses, maybe chew on a toy, and watch his siblings while sitting happily in your lap. When he’s sleepy, he will cuddle in any position as long as he’s getting a belly rub. He will attempt to share your lap if it’s occupied by one of his brothers, but he usually ends up sitting on top of his brother’s head and gazing at you innocently. He is the alpha of the coffee puppies, being the heaviest puppy. He does not throw his weight around, however. He is very friendly and sweet, and generally doesn’t start fights or steal toys/treats from others. But if a sibling starts a fight, he will most certainly finish it! 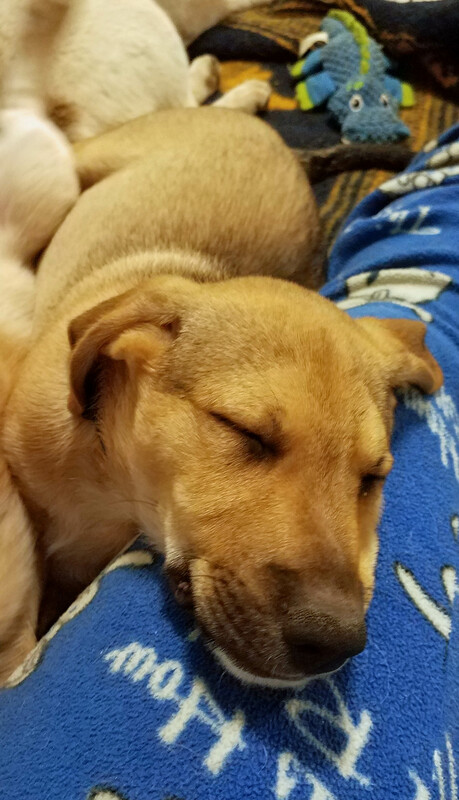 Activity Level: Starbuck is a typical puppy and has large amounts of energy for 1-2 hours, followed by 2-3 hours of napping. When it comes to humans, he will greet you with a ton of energy. After a few minutes of excited puppy kisses and bouncing, he will settle down into your lap, and will sit there for several minutes. He may leave you to go play, but almost always returns to a lap when he wants to sit down and relax. He LOVES chasing tennis balls. He will normally bring the ball back you about half the time, and gets distracted the other half of the time by playing keep-away with the tennis balls. 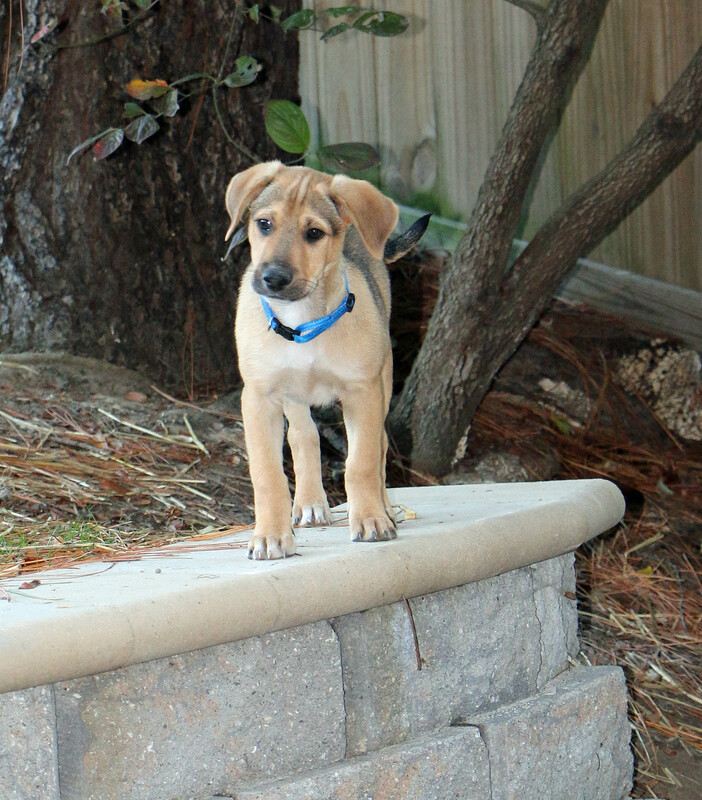 Fence: As a puppy, Starbuck is going to need a fence for the first 1-2 years of his life. 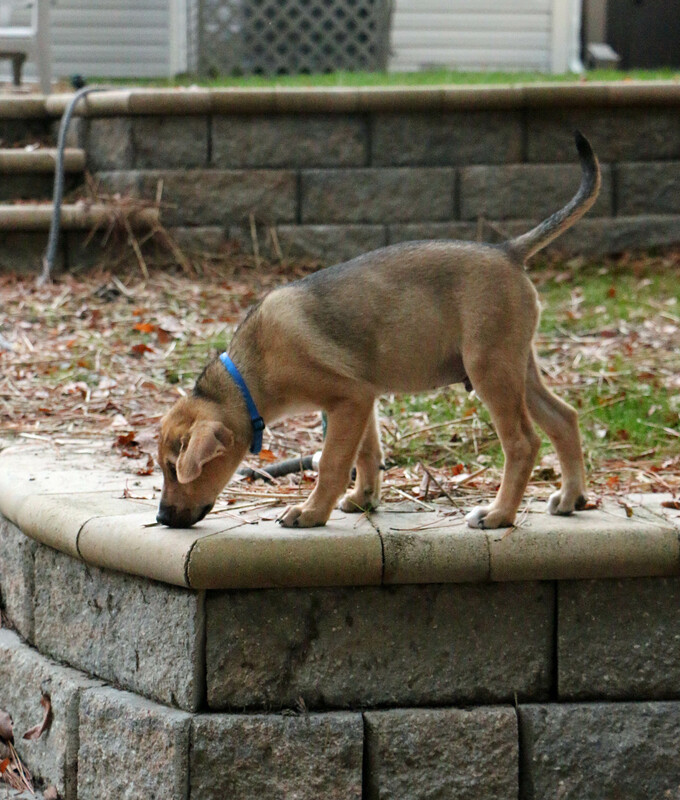 He loves to run across the yard, and still has enough energy to vigorously wrestle and play with his siblings. He will probably be more calm when he gets older, based on his current personality. 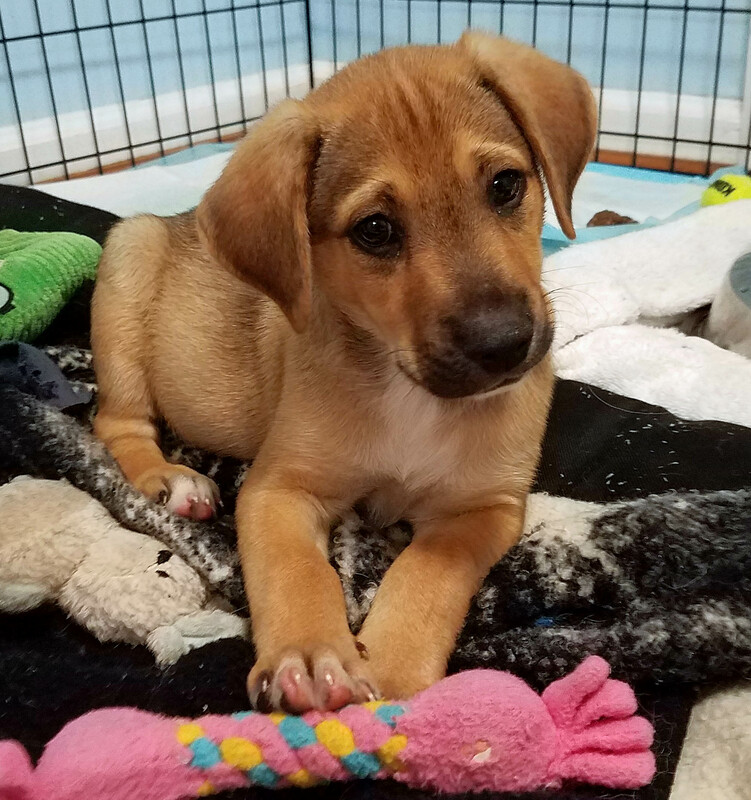 Medical History: Honey’s 4 puppies (Starbuck included) were rescued from Kentucky, arriving at their home on October 20. Not much is known about their history; Starbuck was healthy weight and energy at his last vet visit.